Powder rooms, half bathrooms and some older bathrooms alike all have one thing in common; they all need small bathroom sinks that fit the space and their style. How Much Space Does a Sink Require? If you're building a new bathroom or remodeling an old one, you'll want to find the largest sink you can comfortably fit into the space. Sink placement measurements are dictated by building and plumbing codes, as well as constrained by the size and depth of the vanity installed. Any sink or vanity installed in a bathroom must have a minimum of 20 full inches to sit in by itself. This means finding the center line of where the sink will be located and measuring out 10 inches on either side. Nothing but the sink itself can be in this space. This means that if you need to try to place a sink near a wall to make space for a toilet or shower on the other side, you may be limited to the ultimate size of sink available. A sink that is mounted in a vanity must leave a minimum of 3 inches around its perimeter for the counter and faucet to sit. So a vanity that is only 18 inches deep can only have a sink that is 12 inches deep installed. 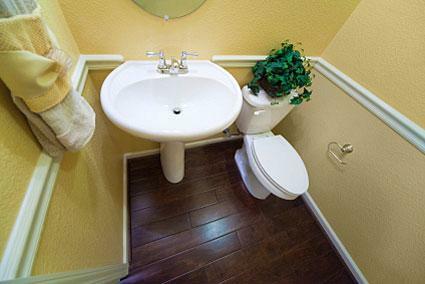 Locating small bathroom sinks may seem like a challenge at first because small sinks are frequently not as functional or decorative as others. There is less space for hands, less space for a faucet and less ledge space for setting things down. 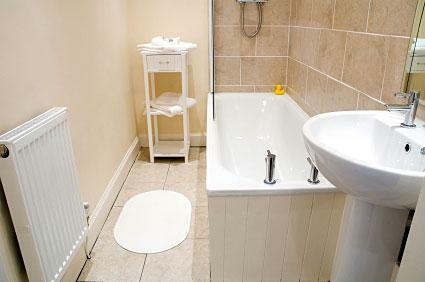 Luckily, many bathroom manufacturers do make some small bathroom sinks that can fit any space and any style. The two smallest pedestal sinks on the market today are the Kohler Parigi and the Cheviot Mayfair. Both measure less than 20 inches in width, giving you plenty of space to put them in. The Perigi is more modern in style, perfect for contemporary spaces. Complement it with a single handle faucet, rather than the 4 inch spread it can accommodate. The Mayfair is classic in style and is the only small pedestal sink of its class to accommodate an 8 inch or widespread faucet. Install any style of faucet and know you'll have plenty of space to clean around it. Several manufacturers make vessel sinks small enough to be mounted in any vanity. The smallest diameter vessel is 14 inches, but vessels are available that have small footprints of only 6 inches, and rims that move outward to 16 inches, allowing just enough space for some counter to be available for placing a bar of soap. When using a vessel sink in a small bathroom, mount the faucet on the wall to help maximize the space. Pedestals are also available for vessels, although they leave no counter space. To solve this problem, consider mounting a shelf just below the faucet, and make sure the faucet's reach extends well past. The smallest vanity sink base cabinets on the market measure 18 inches square. While they do give some storage, if your space is this tight, you may want to consider using a pedestal with an over the john cabinet or some wall shelves instead. No matter what style of bathroom you're envisioning, there is a small sink out there for you. Double check all of your measurements, and remember that just because you can fit a larger sink into the space, it doesn't necessarily mean you should. Let function come first, and style follow for the best looking sink in your small space.